One of the problems many of our customer’s face is curbing hunger in between meals. You’re moving along through the day and suddenly you could use a snack to hold you over until your next meal. So many commonly available snack foods are high in calories, unfulfilling, and just generally unhealthy. Finding a tasty snack that will ward off cravings for unhealthy foods is important for making it through the day, and Crunch O’s are a favorite among dieters. The first thing you will notice when you grab a bag of Crunch O’s is that the bag is actually full. These aren’t packaged like Lays, where you get less than half a bag full of greasy chips and they leave you craving even more unhealthy empty calories. A bag of Crunch O’s (one serving!) is full of this delicious snack so you won’t crave more after digging in. And we haven’t even gotten to how they taste. 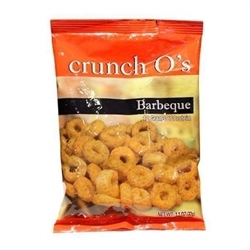 At Bariatric Health & Wellness, we carry Crunch O’s in two flavors: BBQ and Sour Cream & Onion. The barbeque variety is one of our most popular products. The bold barbeque, salty flavor, and crunchy texture will make you feel almost like you’re cheating on your diet—until you look at the nutrition facts. At 130 calories, 12 grams of protein, no trans-fat, and only a half gram of saturated fat, you’re getting a healthy and nutritious snack that will help keep your energy up throughout the day. The protein is comprised of 10 grams of soy protein, and you will be happy to see that they are also cholesterol free. With this kind of nutrition packed into a filling snack, you will have a hard time believing that such a flavorful and enjoyable snack is keeping your diet right on track. Try the Barbeque Crunch O’s or the Sour Cream Crunch O’s from Bariatric Health & Wellness today. And if you’re looking for something a little different, Bariatric Direct offers a wide variety of delicious snacks (link) for you to choose from in our store.